The third year of Impact100 Greater Milwaukee’s grant making is underway. 2018 is another record year with 334 members who will collectively invest $334,000 in the Greater Milwaukee area! Many thanks to the women of Impact100 who have demonstrated their commitment to the Greater Milwaukee community. The grass roots movement of the Impact100 model is sweeping the country. It is exciting to think that in 2015 Impact100 Greater Milwaukee was the 28th Impact100. Three short years later there are 52 Impacts funding change in their local communities and another 9 more under development! Impact100 is a unique model of philanthropy. What make us unique? * We are women who collectively pool our funds because together we can make a bigger impact on our community. * We fund projects and programs across purposefully broad focus areas. * The women of Impact have a unique donor experience. They are welcome to take a front row seat to philanthropy by participating on a grant committee. Thank you FAC and FRC members! * Each member directs her contribution to the community by casting a ballot at the Annual Awards Celebration. 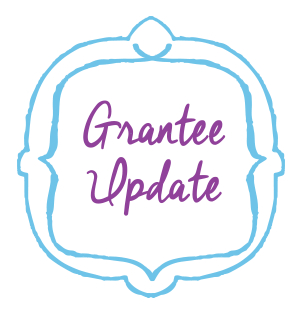 * 100% of the grant pool is awarded to the grant recipients. Impact100 Greater Milwaukee makes philanthropy accessible to women and empowers them as informed philanthropists to make a difference in the Greater Milwaukee community. We thank all our members for their commitment to collective giving and the Greater Milwaukee area. As a new source of funding for the non-profit community, we thank all the wonderful organizations that submitted Letters of Inquiry this year. We are honored and humbled by the essential work you do to make our community a better place. We look forward to meeting our 3rd year Grant Finalists at the Annual Awards Celebration on June 6 at the Italian Community Center. If you know a woman who is interested in learning more about collective giving with Impact100 Greater Milwaukee, or a non-profit who wants to make an impact in the community with a transformational and sustainable project or program, please share our website with them www.impact100mke.org. Here’s to making an Impact together in 2018! This year Impact100 Greater Milwaukee is proud to announce a record membership of 334 members. With the support of this membership, Impact100 will award three $100,000 Impact Grants and two $17,000 merit grants, the largest total given in its history. “We are thrilled to support some of the Milwaukee community’s most pressing and impressive non-profit organizations,” Impact100 co-president Anne Trunzo said. “With our highest-ever membership total, we look forward to continuing to impact our community. 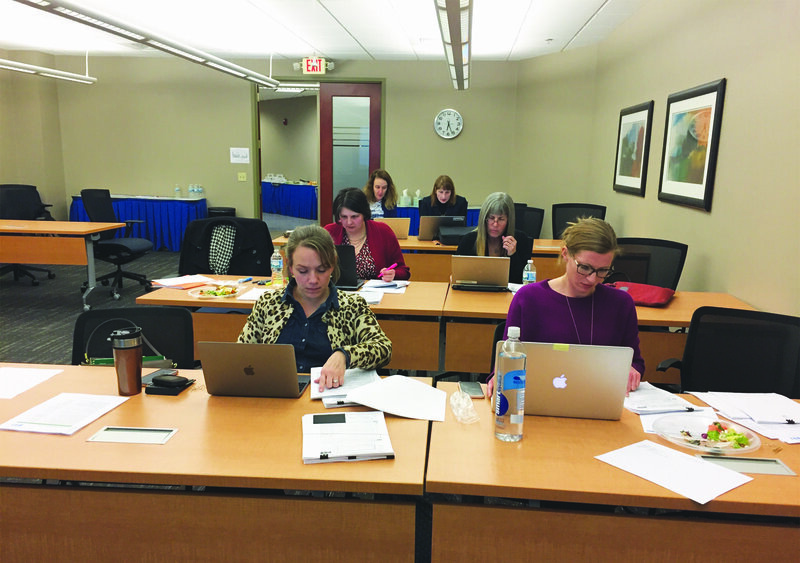 (Top) The Financial Review Committee is hard at work reviewing the financials from non-profit applicants during a January meeting. Bottom, FRC members (top row) Sarah Hammes, Karin Gale, Julie Beres, Joy Hertlein, Kate Hauser (bottom row) Christine Johnson, Amy Hruby, Stacy Scheffer, Barb Kueny are pictured. Not pictured, FRC Chair Pat Locante, FRC Members Sue Connor and Yulia Jigalina. Thanks to all committee members for their hard work! Literacy Service of Wisconsin (LSW) answered Impact100 Greater Milwaukee’s question, “ What would you do with $100,000” by looking up in the sky. LSW realized there was a building boom happening in Milwaukee County. They learned that there was over $7 billion dollars of construction projects planned or underway and not enough qualified local workers to participate. So LSW set out to create a solution. LSW’s thinking out of the box to meet the need of our community resulted in the development of an alternative path toward a high school equivalency diploma approved by the Wisconsin Department of Public Instruction. The program, Building a Pipeline to Lucrative Jobs: An Industry-Focused 5.09 HSED Program, has proven to prepare students for high demand manufacturing and construction jobs. We are proud to announce that the last grant installment to Literacy Services of Wisconsin (LSW), one of our two inaugural $100,000 Grant Recipients, has been distributed. LSW has graduated five students from their first pilot class. The recent graduates have received their MC3 certification among other important credentials. They each have been pre-selected by representatives from the trades for likely employment or apprenticeship training. The second pilot class will begin shortly. Literacy Services is paving the road for many undereducated adults to achieve productive and sustaining employment. 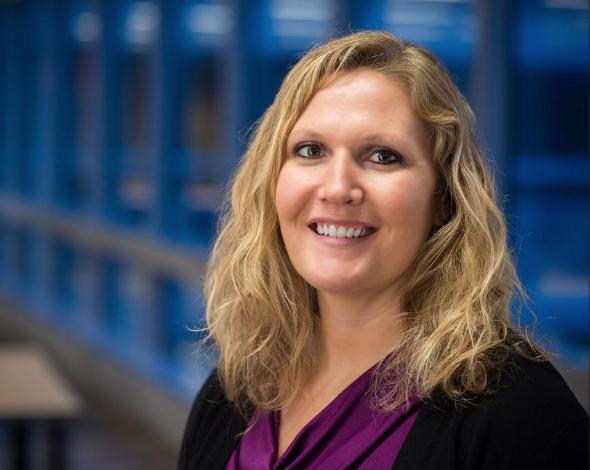 According to LSW Executive Director, Ginger Duiven, funding has been secured for the pilot program to become an integral part of the Literacy Services of Wisconsin in conjunction with WRTP/ Big Step curriculum. Congratulations to the graduates and to Literacy Services of Wisconsin! Special thanks to Andrea Nemecek, owner of Allume Architects, who provided pro bono architectural services to Neu-Life Community Development, one of our inaugural year $100,000 grant recipients. Andrea was looking for a different organization where she could volunteer and donate. Through her friend, Amy Hruby, she was introduced to Impact100 Greater Milwaukee. Andrea actively participated on the Health and Wellness grant review committee. She mentioned to Neu-Life she would be happy to be a resource if they needed help building their commercial kitchen. The kitchen needed a lot of work. What should the layout be? Where should they place equipment, tables and appliances? She assisted in figuring out the prep area, circulation and flow. Things evolved. She worked closely with Jody Rhodes, Executive Director and Joann Harris-Comodore, CEO of Neu-Life. Andrea brought her sons, ages 10 and 13, to help with measuring. She explained the concept of Neu-Life and what they do to empower youth with skills and strategies to make better life choices. It was a wonderful teaching moment for her children. She provided architectural plans to get the necessary permits from the City of Milwaukee. She did all of this and no fee! Our Impact100 Greater Milwaukee founding member and board member Jill Boyle was honored as one of Milwaukee Business Magazine top 40 leaders under 40. Professionally, Jill works as a senior manager at Sikich and has over 13 years providing tax and compliance services to clients. 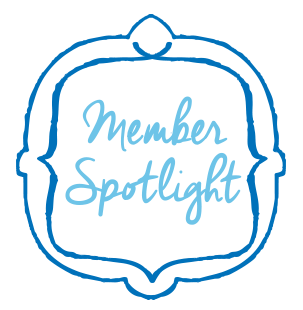 She advises not-for-profit organizations on tax planning, income structuring and more. Jill’s passion for volunteering is evident in the many organizations she is a part of. In addition to being a founding member of Impact100 Greater Milwaukee, Jill helped found Momentum Milwaukee, a networking community for emerging women leaders, is part of Greater Milwaukee Foundation’s Young Professional Advisor Group and serves as a finance committee member for Meta House, a drug and alcohol treatment facility for women. Jill also serves on the boards of Running Rebels Community Organizations, Down Syndrome Association of Wisconsin Family Services and, of course, as the Grants Manager Director for Impact100 Greater Milwaukee. Also among the honorees are Impact100 member Heather Dunn, chief financial officer at West Bend Mutual Insurance Company, and Mike Jurken, owner of Majic Productions and supporter of Impact100 Greater Milwaukee’s Annual Awards Celebration. 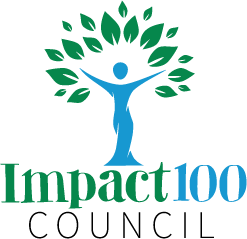 Check out Impact 100 Council’s latest newsletter here! Thank you for making an impact with us!